Large thermal solar power plants. In these plants the heat is concentrated in a point to generate steam, with the steam a turbine is activated to generate electric power. Once the heat is generated, the operation of a solar thermal power plant is very similar to that of a thermal power plant or a nuclear power plant. The difference is that a thermal power plant the heat to generate the steam comes from the combustion of fossil fuels, usually coal, and in a nuclear power plant, the heat is obtained by fissuring the nucleus of uranium atoms. The collectors of solar thermal energy are responsible for capturing the thermal energy of solar radiation. These solar collectors are classified as low, medium and high temperature collectors depending on the way they work. Low temperature collectors. They provide useful heat at temperatures below 65 ° C.
Medium temperature collectors. They are the devices that concentrate solar radiation to deliver useful heat at a higher temperature, usually between 100 and 300 ° C.
High temperature collectors. They work at temperatures above 500ºC. They are used for the generation of electric power. The solar radiation collection system consists of solar collectors connected to each other. Its mission is to capture solar energy to transform it into thermal energy, increasing the temperature of fluid circulating through the installation. There are a lot of systems for capturing solar radiation. The choice of one system or another will depend mainly on whether it is solar thermal installations of low, medium or high temperature. Flat solar collector. It is the most widespread solar collector, you can get temperature increases of 60 ° C at a reduced cost. It is used in low temperature thermal solar plants. Non-glazed solar thermal collectors. It is common, for example, to heat pool water. The temperature increase is low, around 30 ° C. They are more economical than flat solar collectors. Solar vacuum collectors. They consist of metal tubes that cover the metallic tube that contains the working fluid, leaving between them a chamber that acts as an insulator. They have a very high yield, but their cost is also high. 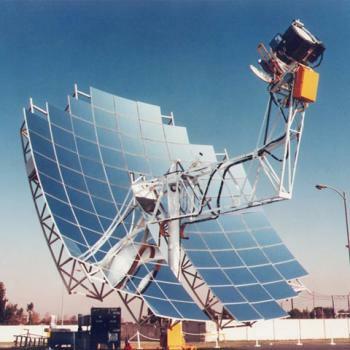 Solar collectors with radiation concentration systems. They are used for installations that require higher temperatures. Parabolic or semi-cylindrical panels are used. Solar thermal collectors with tracking systems for the position of the Sun. Its position varies throughout the day to maintain a position perpendicular to the received solar radiation. Consists of storing the heat energy in an accumulation tank for later use. The hot water obtained through the collection system is conducted to the place where it will be used. The stored hot water can be used directly, as is the case of heating the water of a swimming pool, in hot water or heating applications the demand. Because the moment of need for hot water does not always coincide with the time when there is enough radiation it will be necessary to make the most of the hours of Sun to accumulate thermal energy in the form of hot water. The thermal energy storage system consists of one or more hot water tanks. The size of the storage tanks must be proportional to the estimated consumption and must cover the hot water demand of one or two days. Once the solar collectors have heated the heat carrier medium (water or air) increasing its thermal energy, we can transfer this thermal energy to other colder sources. In this system all the elements destined to the distribution of the heat carrier medium and packaging to consumption are included: control, pipes and conduits, expansion vessels, pumps, purgers, valves, etc. Also part of this system is the support system based on conventional energies (electric, gas boiler or gas oil), necessary to prevent possible faults derived from the absence of solar radiation and to deal with peak demand. The solar thermal installations need conventional support systems in anticipation of the lack of solar radiation or consumption exceeding the dimensioning. In most cases, both in installations in single-family homes and in residential buildings, solar installations are designed to provide homes with 60-80% of the hot water demanded, although in areas with high sunshine throughout the year. year, the contribution percentage is usually higher. These energy support systems can be from various sources. If the installation is connected to the network, it can take advantage of the electricity supply of the electricity company itself. In other cases you can use other sources of renewable energy (wind energy or hydroelectric energy if conditions permit) or non-renewable energy sources. Non-renewable energy sources can be from fossil fuel derivatives ( oil, coal or natural gas), in some installations pellet or biomass boilers are used. In the months of lowest solar radiation does not reach to cover 60% of the energy needs. On the contrary, in the summer months almost 100% of them are reached. Thus, the objective with which solar thermal installations are designed is to cover a minimum of 60% of the annual energy needs depending on the geographical area. Pretending to cover over 60% or 70% per year of solar thermal energy would require a very large solar field, which would result in a very high cost that would never be amortized. In addition, such a large solar thermal installation would cause in the months of increased solar radiation a production surplus that could not be used and would cause overheating problems throughout the installation. For this reason, the facilities that work best and are previously profitable are those that need sanitary hot water for the whole year, heating for winter and have a swimming pool for summer or even the whole year. The initial investment of a solar thermal system will be higher compared to a conventional energy supply system. On the other hand, the cost of operation during the more than 25 years of life of the solar thermal installation will be irrelevant compared to the purchase of fuel or electric power, repairs, maintenance, etc. associated with the conventional energy system. The installation of solar thermal energy is economically more economically advantageous, since all the energy that we obtain from the Sun with the solar thermal sensors, will be energy that we will save it from producing (burning fuel in a boiler) or consuming (from the network electrical distribution). A solar thermal installation ends up being profitable throughout the years, since the energy saving that it produces materializes in economic savings, which allows to end up amortizing the cost of the installation. This depreciation may vary between 5 and 12 years depending on the size of the installation, the aids obtained from the lost fund, the place where it is installed (more or less solar radiation) and the user's greater or lesser needs. In the case of placing these solar thermal installations in new construction or rehabilitation housing, the amortization can be considered instantaneous, since the increase that represents in the total price of the house is very small; the amount paid for that higher cost in a mortgage loan each year is less than the amount in euros that implies the lower cost of gas or diesel. Economic advantages. For the same needs, the conventional system will need to consume less fuel (derived from fossil fuels or biomass), which will represent a lower annual expense for the user. In addition, solar energy is independent of conventional fuel and its supply, given that it is compatible with any conventional system and independent of the variation in the purchase price of fuel. Environmental advantages, since the generation of energy with conventional systems has very significant environmental costs (CO2 emissions, climate change, greenhouse effect, discharges, nuclear waste, acid rain, etc.) in relation to solar systems. On average, one m2 of solar thermal collector is able to avoid the emission of one tonne of CO2 each year. Easy maintenance. The useful life of solar thermal installations is over 25 years and the maintenance required, although it is necessary to do, is much smaller than in the case of conventional systems. However, the installation of thermal systems presents a drawback: installation of the same conventional system is required as would be the case if the solar collectors were not installed. Sometimes it is problematic to assemble them in existing buildings as a consequence of their lack of foresight at the project level. A solar thermal power plant or solar thermal power plant is an industrial facility in which solar radiation is used to generate electricity. Obtaining sanitary hot water is one of the most widely used applications of solar thermal energy. These systems take advantage of solar radiation to heat hand water or water from the heating circuit. Low-temperature solar thermal energy is used in applications that require temperatures between 100ºC and 250ºC. The high-temperature solar collectors work at temperatures above 500 ° C. They are used for power generation. Desctiption of the technologies used. A solar thermal installation consists of solar collectors, a primary and secondary circuit, heat exchanger, accumulator, pumps, expansion vessel, pipes and a main control panel. There are a large number of applications of solar thermal energy: heating systems and domestic hot water, electricity generation, cooling systems.